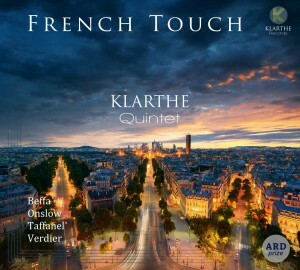 Designed around four French composers of the nineteenth and twenty-first centuries, “French Touch” is the debut album of Klarthe Quintet. It was released in October 2015 and if you were looking for a present for a lover of wind instruments, you just found it! Clement Dufour (flute), Marc Lachat (oboe), Julien Chabod (clarinet), Guillaume Bidar (bassoon) and Pierre Remondière (horn) enlighten both “classic” or specially commissioned works in this recording. You will enjoy the rediscovery of the quintets by Paul Taffanel and George Onslow, such great masterpieces in the wind quintet repertoire. 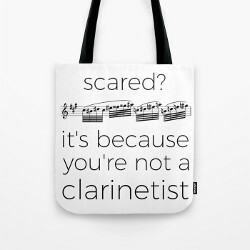 And you will enjoy the discovery of two extraordinary pieces, too. 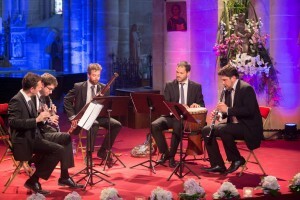 In “Amazonian dreams” by french clarinetist and conductor Jean-François Verdier, the musicians of the quintet also play percussion instruments in order to enhance the musical language. In some passages the energy is mostly tribal, but then it becomes much calmer, clearly referring to the dreams mentioned in the title. In “Five o’ clock”, Karol Beffa wrote a very mechanical music, based on the idea of a clock, ticking. It could have been annoying, but the composer successfully uses all the combinations and variety of sound of all five instruments, and “Five o’ clock” is a really great piece. The overall sound is simply stunning. The colorful sounds of the instruments fit perfectly with each other, both in the lyrical phrases and the rhythmic and dynamic passages. Klarthe Quintet has won many awards at ARD competition of wind quintets in Munich and just got 4 stars from Classica magazine. It is well deserved, considering the excellent quality of these musicians and this recording. You can purchase the album on Klarthe, itunes or listen to it on deezer.